Troops can be given basic orders with the party commands, but the command interface allows more advanced strategic decisions. To open or close the command interface, hit Backspace (note that it cannot be used in the arena, during tournaments, or in Quick Battles). The screen will be filled with various overlays (shown to the right). While this interface is open the mouse will control the cursor rather than the player character, although you can still control your movement with WASD (to move your view point the cursor to a screen edge). 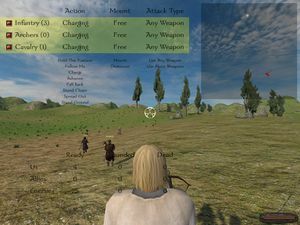 The party commands section lets you see the behaviour of your forces at a glance as well as how many you have of each troop type, whether they are using blunt weapons, and whether they have horses (note that companions count as infantry if on foot or as cavalry if mounted, even if they have ranged weapons). The words on screen are links, and can be clicked to give orders. These orders can also be given using the party commands keys. To give an order to particular troop types rather than to all your forces simply check and uncheck the boxes until you get the result you want. To the far right of the command interface is a semitransparent mini-map. 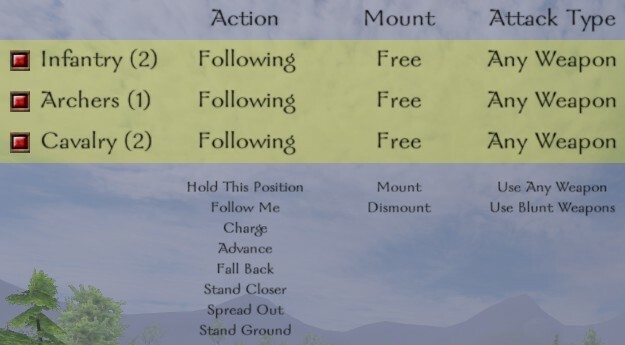 This view does not show hills or other terrain features so it is up to you to position your troops effectively. Each troop type you have has a different color as do allies and enemies. The light grey circle represents your current location, and the small arrow on it shows what direction the camera is facing. You can move your troops about using the map. Simply click anywhere on it to set a gather point (the same as the "hold position!" 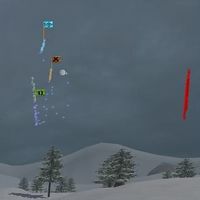 command), and a flag will appear on the mini-map to mark the spot. By default, all troops will follow the same gather point; you can select and deselect the check boxes on the party commands section to choose what troop types will gather, which allows you to set multiple gather points. Allied troops have no gather point flag and are not under your control unless you are the marshal of your faction (see Factions). If you are the marshal of your faction, allies from your own faction will be placed under your control in any battle you take part in. Any commands you issue will direct their forces as well as your own troops (you cannot command your men separate from those of your allies); their representative dots will be colored by type just like your own men rather than using the ally color. Allied forces will still be counted separately on the troop readout. The troop readout has a real-time count of troop numbers and casualties on each side. This is a good way of seeing at a glance how your forces are faring. The "Wounded" category is for men that have been knocked unconscious; those who have been injured but are still fighting are instead counted in the "Ready" totals. This page was last edited on 14 June 2009, at 03:38. This page has been accessed 65,108 times.